The SEA Model WC-3000 Robust Water content System was designed to provide aircraft and wind tunnel users with a single, rugged sensor to measure Total Water Content (TWC). The instrument consists of one heated stainless steel element. The element is directly heated by low voltage dc current flowing through the element. The element is maintained at a constant temperature, typically 140 °C, by a digital, closed loop, control system. Given the dimensions of the element and the true airspeed of the airflow the power level set by the control system to maintain temperature can be converted directly into the water content of the air stream. The instrument uses a scoop shaped sensor to collect both liquid water (LWC) and ice crystals ( IWC). The combined total of LWC and IWC is referred to as Total Water Content (TWC). In addition to temperature control for the heated element, the deice system is also temperature controlled. During operation the deice power is adjusted to maintain the instrument housing at a constant 50 °C, which is comfortably warm to the touch. Maintaining the instrument housing at a constant temperature provides a stabilized thermal environment around the sensing elements which leads to improved LWC and TWC measurement accuracies. 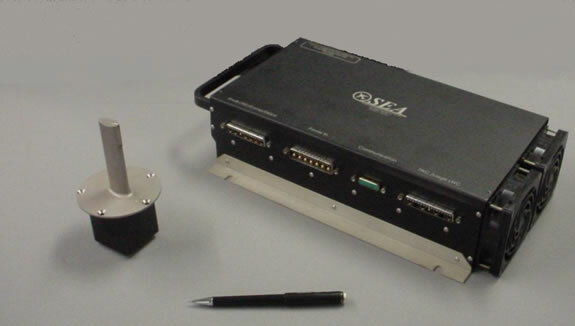 The system consists of three major components, the sense head, the power box and the control unit. The sense head is mounted in the air stream. The power box is mounted near the sense head. The control unit is mounted where it is convenient for the user. The power box for the Robust Head can be redesigned to fit within a standard PMS or DMT canister. The control unit can be built in many different packages from a standard 19" rack unit that is 4U high to a Zeus rail unit that is 6" x 6" x 10" deep. The control unit can also be imbedded in SEA's M300 DAS.